Finally, the most easily convertible infinitely adjustable Standing Desk you've been looking for has just been released! Enhance your work experience with G-PACK PRO Desktop Standing Desk Converter. Unlike other desk converters that limit your options, the adjustable desk converter by G-PACK PRO gives you as many options as you need! Our adjustable desk converter rises and lowers vertically, saving valuable space in your workstation, offering better stabilization and a more comfortable reading distance. Enjoy a more comfortable working position while increasing your productivity. Our improved single-handle resilient spring hovering mechanism makes it super easy to safely adjust the height of the desk, offering you a multitude of height options in a matter of seconds. You will never need to use two hands or extra force. Designed with a large 35" workspace, our convertible computer desk gives you the space you need to accommodate dual screens and any other tools you need to get your work done seamlessly. Features that make us stand out: Change the sit-to-stand desk riser at any point, from 5.7" to 19.7" to find the perfect height. Adjust the desk stand riser with only a light squeeze of our improved single-handle resilient spring hovering handle. Don't have to take up extra room for your desk. Thanks to the straight up and down movement contained to its own footprint. Made from super high-quality heavy-duty materials and offers a sturdy triple leg base. Removable keyboard tray for user preference ensuring more room for bigger projects and a cleaner workspace. Very minimal out of the box assembly! Place on your existing desk and start organizing your workstation. Use at home as well as the office! Feel free to sit or stand. Feel awesome while you work. Click "Add to Cart" and improve your work posture today! Support Healthy Living: The Standing Desktop Desk effortlessly converts your existing workstation into a standing desk, enabling you to achieve long lasting health benefits. Create Work Space: The 32&apos;&apos; surface area creates a spacious desktop for your monitor, keyboard, and mouse with room to spare. Plus, you gain additional space under the stand up workstation. Adjust Desk Height: Snap buttons and telescoping legs create an adjustable height desk that you can raise and lower 1&apos;&apos; at a time to 6 different levels. Rubber feet protect the existing surface from damage. Dimensions: Desk Surface area 32&apos;&apos; W x 23.5&apos;&apos; D, Height adjusts from 11.5&apos;&apos; to 16.25&apos;&apos; Assembly: Your standing desk is assembled in minutes with only 8 screws (included). The Standing Desktop Desk will transform your workstation into a stand up desk. The Standing Desktop Desk is an affordable alternative to a traditional standing desk and is designed to sit on top of your existing desktop or modular workstation. This standing workstation has 4 telescoping legs and can be adjusted to 6 different heights at 1" increments. The 32" surface allows your monitors, keyboard, mouse, speakers, and work materials to be easily accessible. Models and props not included, desk pictured underneath the desktop desk not included. Convert any desk or table into a truly ergonomic sit-to-stand workspace with the LIFT Standing Desk Conversion. The 2-piece design features an adjustable-height computer monitor riser that raises screens to eye-level for sitting or standing an ergonomic, adjustable height and angle keyboard stand that lets you type with a neutral or negative wrist angle. 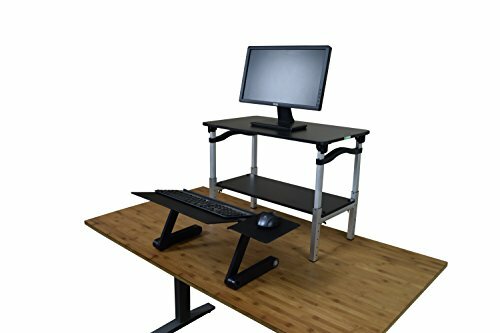 - FULLY ADJUSTABLE DESK RISER WITH REMOVAL KEYBOARD: Whether you're 5'1" or 6'1", enjoy adjusting your sit to stand desk converter to any height, that's right for you in one easy smooth motion. Standing desk converter may rise upto an impressive height of 19.7" as required. The keyboard tray is removable for user preference. 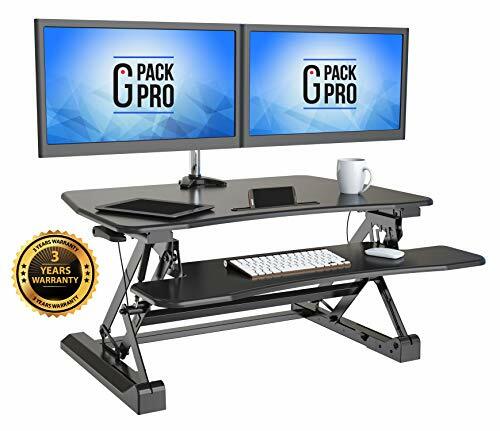 - CONVERTER FOR SIT-TO-STAND WORK: The G-PACK PRO stand-up desk converter is easy and effective way to make working more comfortable. It allows you to find the needed healthy balance between sitting and standing throughout the day as well as enhancing your posture. It is sturdy and simple to install. Enjoy more ergonomic positions while you work at your computer! - COMMODIOUS STANDING DESK CONVERTER: Don't occupy space with your desk converter - make more! Our laptop desk converter is 35" wide. It rises and folds vertically so that your desk stays organized and uncluttered. Sturdy enough to hold 2 monitors or your beloved iMac, all of your favorite accessories and anything your super powers require. Customize your work area and create the workflow you need. - SUPER QUICK TRANSITION: The G-Pack Pro Desktop Standing Desk Converter features a resilient spring hovering mechanism that allows smooth adjustments in a matter of seconds. Just squeeze the handles to easily move up or down. Desk moves straight up/down with no wiggling while transitioning! - Assembly: Your standing desk is assembled in minutes with only 8 screws (included). - Create Work Space: The 32" surface area creates a spacious desktop for your monitor, keyboard, and mouse with room to spare. Plus, you gain additional space under the stand up workstation. - Support Healthy Living: The Standing Desktop Desk effortlessly converts your existing workstation into a standing desk, enabling you to achieve long lasting health benefits. 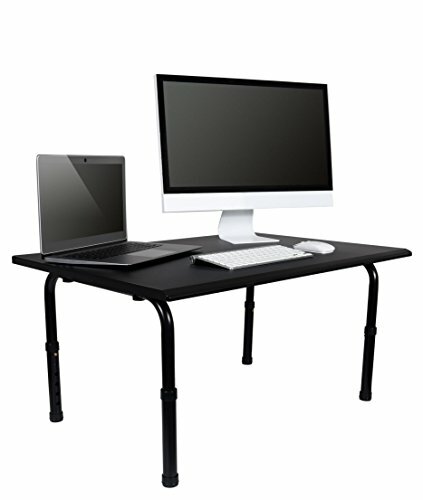 - Adjust Desk Height: Snap buttons and telescoping legs create an adjustable height desk that you can raise and lower 1" at a time to 6 different levels. Rubber feet protect the existing surface from damage. - Dimensions: Desk Surface area 32" W x 23.5" D, Height adjusts from 11.5" to 16.25"
- STANDING DESK CONVERTER FOR LAPTOPS & DESKTOPS: Sturdy design w/ a spacious top panel. Comfortably holds Single Monitors, Small Dual Monitors & Laptop computers. Versatile, portable stand up desk riser. - ERGONOMIC STANDING DESK CONVERTER: 2-pc design lets you adjust the height of your monitor independently from your keyboard for optimal ergonomics. Standing desk includes negative tilt keyboard tray. - STANDING DESK RISER WITH AN ERGONOMIC KEYBOARD TRAY: Fully ergonomic, independently adjustable keyboard tray that adjusts in height and angle, letting you type with a neutral or negative wrist angle. Size X-Large 35" Desk Length: 32"